This unit was purchased for listening pleasure (and review purposes) from the For Sale boards on Head-Fi – I have no affiliation with Astell & Kern or Jerry Harvey Audio, just a desire to hear what they can do with 8 drivers and some serious audio engineering. 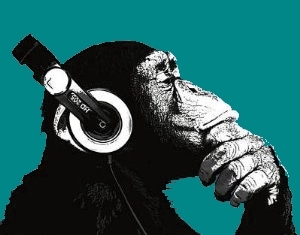 About me: I am a long time music fan but a reasonably recent convert to the world of audiophilia. I listen to at least two hours of music a day on my commute to work, and more when possible. I tend to prefer IEMs for “out and about”, and a large pair of headphones when I have the house to myself and glass in my hand, although that has started to change recently with my exposure to some seriously good TOTL gear. I listen to my music in 320kbps MP3 or FLAC, and do my streaming using Tidal. I am a fan of rock, acoustic (apart from folk) and sarcasm. Oh yeah, and a smattering of electronica. Not a basshead, but I do love a sound with some serious body to it. My ideal tuning tends towards a musical and slightly dark presentation, although I am not massively treble sensitive in general. Please take all views expressed with a pinch of salt – all my reviews are a work in progress based on my own perceptions and personal preferences, and your own ears may tell you a different story. 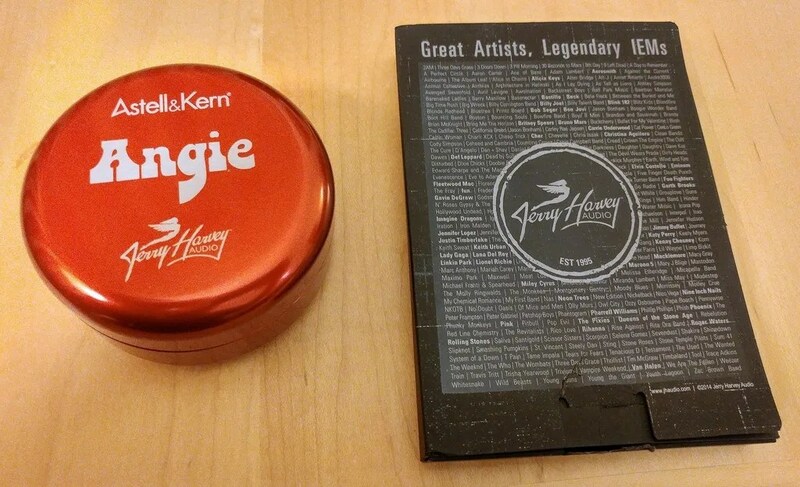 You will think about owning a Jerry Harvey Audio product. Unlike a lot of audiophiles, I first heard about Jerry Harvey way before I delved into the realms of serious audio gear. 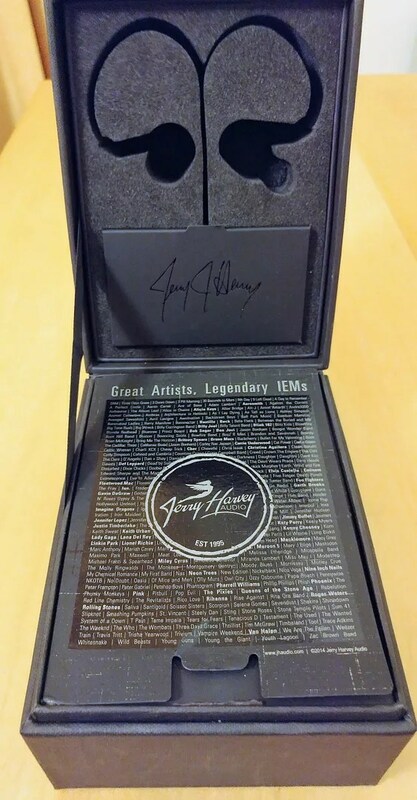 Legend has it that Jerry famously started his audio career as a roadie working with Sammy Hagar and Van Halen, being discovered purely by accident as he was spotted driving a car that Hagar’s manager wanted to use for the singer to drive onstage with at a local arena show. From those humble beginnings Harvey has gone on to develop multiple patents in the IEM industry for his phase correction and quad driver technology (giving them catchy names like FreqPhase and SoundrIVe), and at last count, 11 of the 17 acts who performed at the 2017 Grammys were users of the company’s in-ear monitoring solutions. Having seen the Layla and Roxanne models liberally touted around Head-Fi as some of the best IEMs currently in production, it always appealed to me to try out the JH Audio “house sound” at some point in my audio journey, most likely after I had won the lottery. However, sometimes in life situations occur which you can’t plan for, but you just have to go with. The pair of “original” V1 Angies I have been listening to for the last few weeks are one such example. I had been getting really into music biographies, which led to me working through the Sammy Hagar / Van Halen / Chickenfoot back catalogues on various media while enjoying the very entertaining Mr Hagar’s autobiography “Red” and even sipping a few shots of his own brand tequila (highly recommended if you are into that sort of thing) after curiosity got the better of me and my online shopping cart. 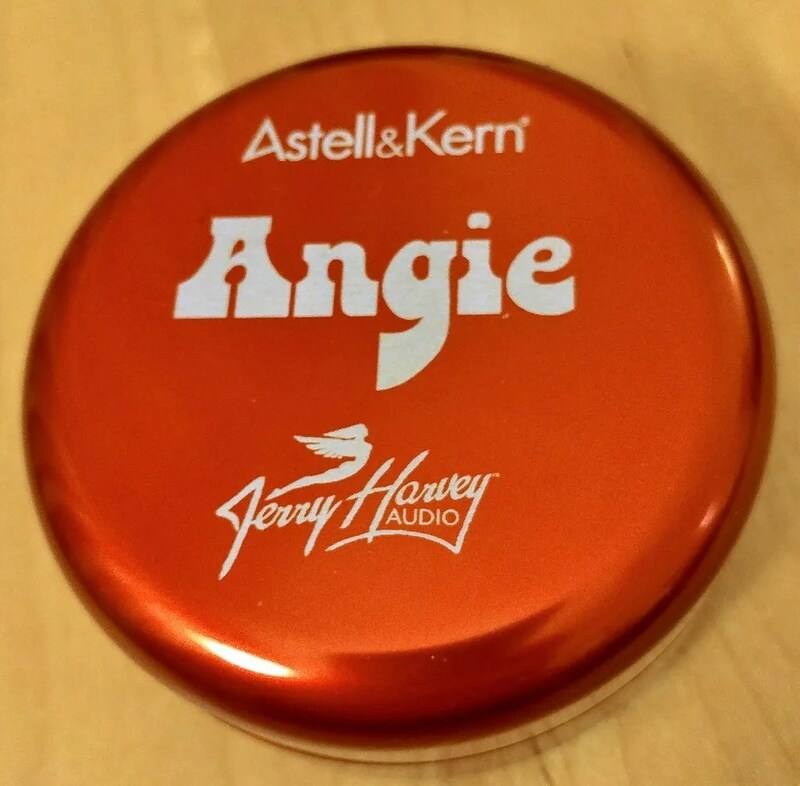 Having run out of branches of that particular story to explore, I was just about ready to move on to pastures new when an ad in the FS boards on Head-Fi for an immaculate condition A&K/Jerry Harvey Audio Angie IEM caught my eye. 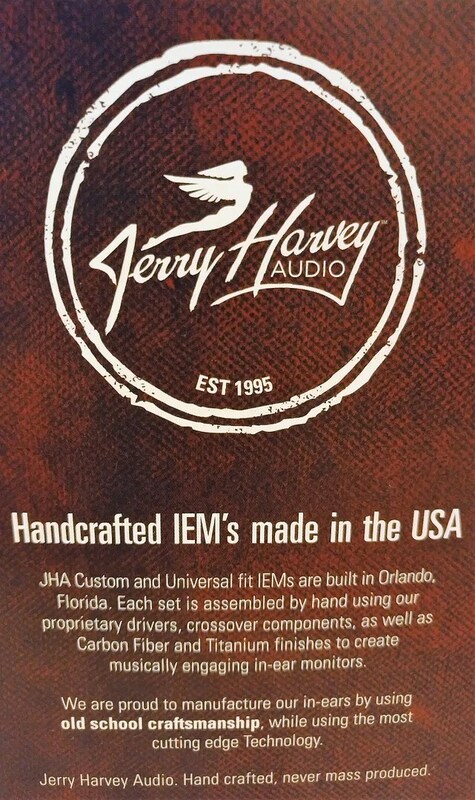 I am a big believer in synchronicity, so when I checked the pics and found out the IEMs were the original red colourway, I took one look at the copy of “Red” sitting on my desk, re-read the chapter about Jerry Harvey and reached for my wallet. While not necessarily the best decision for my bank balance (see point 3 above), my ears are singing a very different and phase-coherent tune. As an Astell & Kern collaboration, it goes without saying that the unboxing is a premium affair. As the “V1” of the Angie has since been replaced with the current Angie II model, there isn’t a massive need to go through the box in minute detail as anyone who manages to find one is likely to be picking it up in varying states of repair on the second hand market. Suffice to say, it presents the IEMs in a very plush way, and has just enough pizzazz to accompany the original RRP without leaving the owner feeling short-changed. Lots of black foam, two high quality 4-pin cables, a solid metal IEM case with the Angie logo on the front and a pleasing cherry red colour and heft to it and the usual assortment of silicon and Comply foam tips are all nestled neatly inside, along with a tuning screwdriver to adjust the bass potentiometer built into the bottom of the balanced and unbalanced cables. 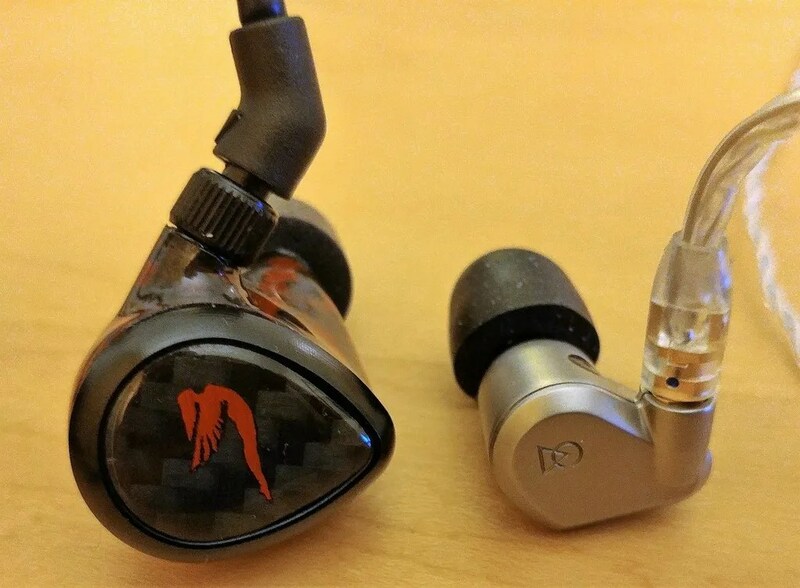 The Angies are a unique looking IEM, with a shell that sits somewhere in shape between the Noble K10 and a breeze block made out of woven carbon-fibre (the later version uses a solid metal body, but the shape is similarly chunky). They are a serious looking piece of gear, with a long nozzle and a deep and solid insertion. 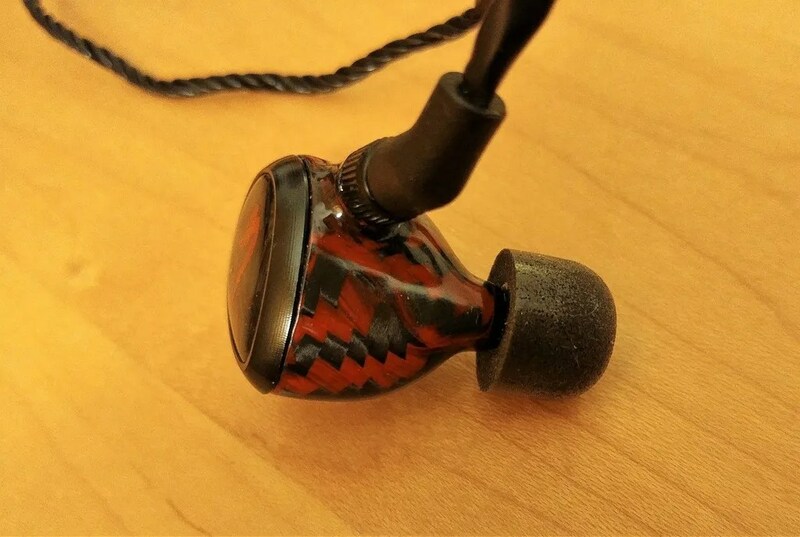 with a red and black Kevlar chequered weave making up the large lozenge shaped body of the IEM, with a small ring around a carbon fibre faceplate on the exterior. 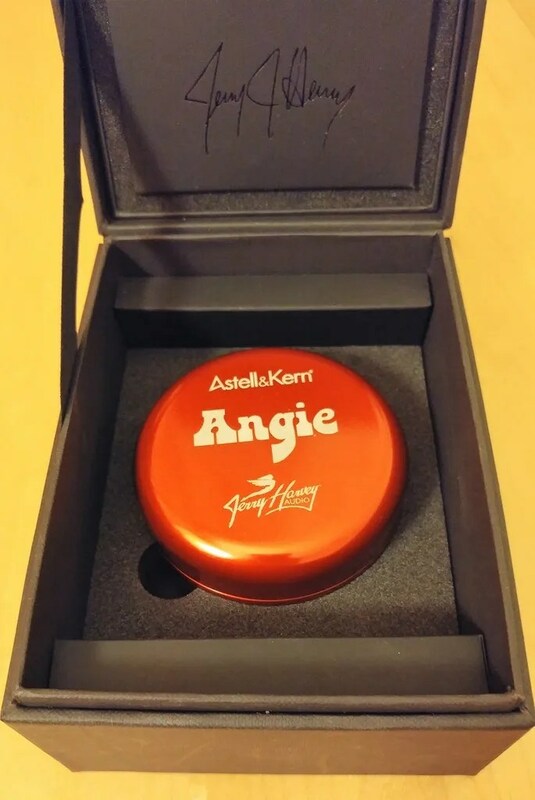 The branding is shared between Astell & Kern and Jerry Harvey, with a red “A” logo from the Korean audio giant on one shell and the famous JH “flying lady” on the other. Along with the proprietary cable that is thick but surprisingly flexible, this is a rather bold and uncompromising design that will polarise many onlookers – I fall into the bracket of people that like the look, but I imagine they will be a little big for many. The original version of the Angie is an all carbon-fibre affair. The overall look is very sleek and eye-catching, with the weave on my set being tightly knitted together (these are hand-assembled) and the red accents on the JH and A&K logos catching the light very nicely. 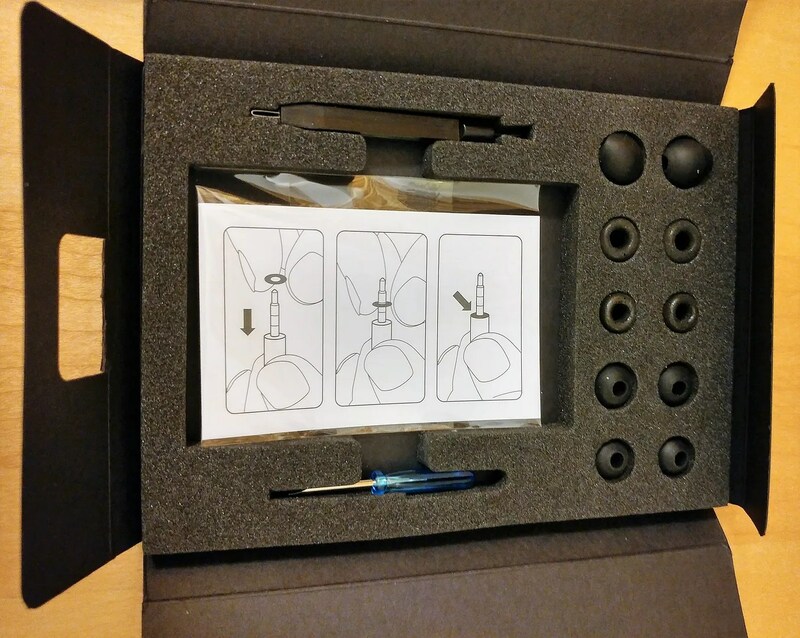 The IEMs are finished to a high quality, with only the slightly “hand-made” looking stainless steel boreholes (three of them) in the stem of the earpiece giving anything other than a high-class appearance. The included cabling is also top-notch, with both the balanced and unbalanced cables being made of a thickly braided yet surprisingly flexible black cord, terminated in JH Audio’s proprietary 4-pin connectors, which screw into the IEM housings with a threaded o-ring fitted to the cable end of the connector to ensure a solid and stable fit. The cables look and feel great, and look strong enough to use as a makeshift tow-rope if your car ever breaks down while you are listening to them. Allied to the screw in connection, these aren’t an IEM you will have to worry about losing off the end of you cable if one earpiece slips out of your ear. 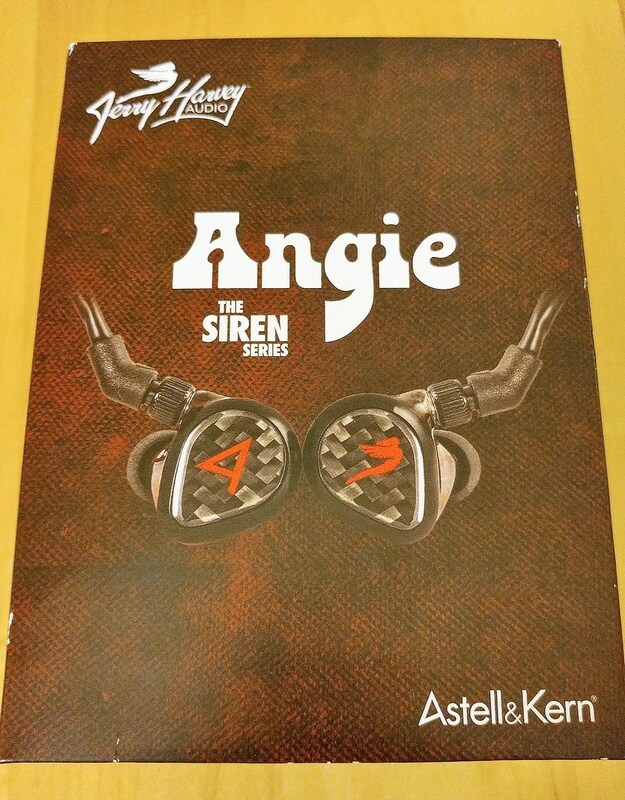 You may have to worry about the property damage something that size might do if it hits anything on its travels, though – despite being the smallest of the “higher end” JH Audio universals from the original Siren Series, the Angie is still a massive in-ear monitor, sticking out almost half an inch from the outside of my ear when worn fully inserted. In spite of the large shells used to house all the proprietary driver tech inside, the Angies are actually a surprisingly comfortable fit for my large ear canals. They never quite disappear like other TOTL models I have tried do once inserted (the Campfire Vega, for example), and sleeping in them is definitely out as they protrude so far out of the ear, but once seated, the feel firm and smooth, and allow for extended listening without any discomfort for me. I have to use large Comply foams to achieve a seal, as none of the included silicon tips or my tip library of various other brands (Trinity Audio Kombi, Spinfit etc) managed to make a proper seal with my admittedly large right ear canal. One tip I have heard that matches well due to its size is the JVC Spiral Dot, but sadly I don’t have any in my inventory at the moment to try that particular matchup out. Moving on to the cable, both of the provided cables are thick but surprisingly pliable and don’t seem to suffer from memory or microphonics. This is an IEM that can be used “on the go” if needed, but as it takes a little effort to seat them comfortably and carry them around, this is more likely to be suited to home or stationary listening. At 17 Ohms and 117dB sensitivity, the Angie isn’t an IEM that needs an amp to shine, and is easily capable of reaching armature (and eardrum) damaging volume levels from most modern smartphones or DAPs. The signature is quite forgiving, and sounds good out of pretty much anything, so again, doesn’t absolutely NEED a high voltage, high end source to sound good. On the flip side, the clarity and staging of the IEM can scale very easily with higher end gear, so the further you climb up the audio chain, the more of the Angie’s overall sonic potential you can unlock – playing the same test tracks through a Fiio X5 or X7 and my LG G5, the “bump” in SQ is noticeable, with the DAPs exerting a tighter grip on the detailing and dynamics of the music than the G5 is capable of. In fact, the Angie appears transparent enough not to be the bottleneck in SQ improvements using any of my current mid-fi gear – I’m sure people using a £1k+ DAP like the Lotoo Paw Gold or some of the more expensive A&K gear will probably start stretching the limits of what the IEM can do, but for most, this is an easily matchable but extremely scalable IEM. It would be remiss to write something about JH Audio without mentioning one of the many patents they cram into their gear like a sweet-maker crams E-numbers into a lollipop. Take US Patent 8925674, for instance (known to its friends as “Phase correcting canalphone system and method”). Harvey and his collaborators were the first company to identify that the soundwaves from the different low, mid and high range drivers were arriving at the business end of the earphone with a tiny “lag” between the frequencies (measured in milliseconds). Utilising a series of stainless steel wave guides to control the path of the sound from each driver, the sound coming from the higher-range drivers takes a longer route to get to the sound bores, ensuring the frequencies are perfectly phase coherent when they arrive. 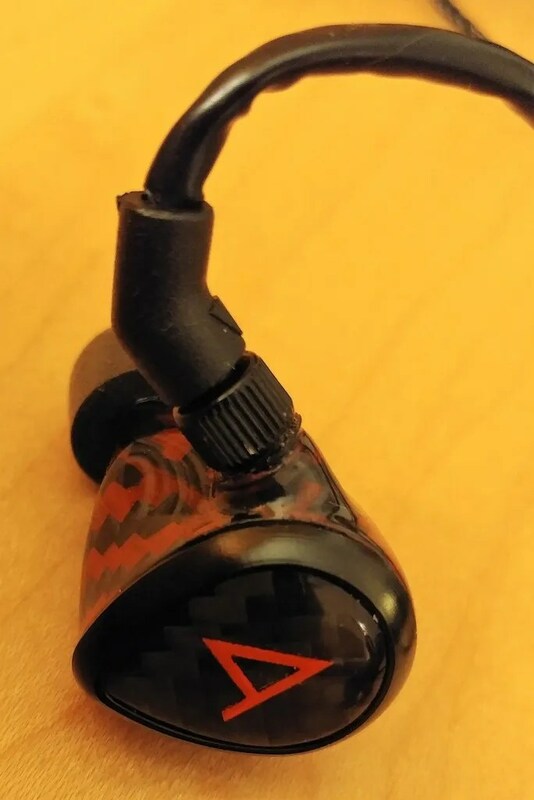 Another tweak to the usual IEM design language are the nozzles used, which are designed to be longer and thinner than standard, giving the JH earphones their trademark ice pick business end, and help to shape the sound. Why go to all this effort, you ask? The brain is a fascinating piece of engineering, able to correct minor inconsistencies in sound “on the fly”, recognising and filling in micro-gaps and glitches while it is busy processing the pressure waves into something your conscious mind recognises. This “distortion” has been said to affect imaging and spatial cues, and lead to listening fatigue as the brain has to work harder to make sense of what it is hearing. The phase coherent sound in the JH IEMs helps alleviate this, allowing for a more natural presentation in the mind of the listener and reducing fatigue in long listening sessions. Now, whether all this works on a scientific or merely psycho-acoustic level I can’t really tell, but one thing I do know is that whatever the tech is doing, it definitely paints a sound that feels more “real” than a lot of IEMs I have heard. As the first true “Top Of The Line” all-BA earpieces I have tried, I was expecting something possibly more surgical or clinical in presentation, with the crispness and clarity that a good BA setup can produce. What I didn’t expect was the level of bass these IEMs can produce with their in-cable potentiometer, and the feeling of authenticity and natural tonality they give to the music. The word clarity is over-used in audio circles, but I feel it definitely applies to the Angie – on first listen, the treble is clear but not razor-sharp, and the voices ring out naturally, without leaning too far forward and without any shiny edges or emphasised inflections. The longer I listened, the more I was able to pick out the fine detail sitting in the treble, and the texture and “right there” feel to the vocals that only a great IEM can bring to your ears. The sound just feels right, with a clearness of sound that allows you to pick up small vocal inflections or tiny scraps of detailing in the higher registers without ever screaming or highlighting them in the overall soundscape. It just feels like you are there in the room with the players. Quantifying the bass output of the Angie is quite a difficult task. Not because of any Mona Lisa tendencies in the dual balanced armatures used to generate the bottom of the frequency range (JH Audio have plenty of patents, but none of them are called Da Vinci as far as I know), but more because the IEM has a variable bass output, determined on each channel by a tunable potentiometer built into the lower portion of the cable. Tuned to minimum, the Angie sounds dry and lean, with plenty of speed and detail but a sparseness to the lower end that would do Philip Glass proud. Tuned to maximum, a +10db or more swing in bass (centred around the 60Hz band) will bring the sound very firmly “In Da Club”, thickening and warming the bass and even mildly colouring the lower mids at full tilt. I found my personal sweet spot with the dials set to around 2pm, which seems to be a common “middle ground” for owners of the Angie if you read the various Head-Fi forums – please note that unless otherwise mentioned, all subsequent sonic impressions are based on this setting. At 2pm, the bass is thicker than you would expect from an all-BA setup, but not overpowering, staying firmly in its boundaries and leaving the midrange clean and clear. It feels ever so slightly slower than some other all-BA sets I have heard, but doesn’t feel slow – in fact, it feels quite nicely organic, with just enough softness to the sound to avoid it sounding artificial. In terms of extension, the stated spec sinks down to 10Hz, and while it isn’t massively prominent in the extreme low registers compared to a more sub-bass focussed IEM like the Ibasso IT03, the extension is still clearly audible and reasonably strong all the way down. When it comes to terms like slam and rumble, the Angie definitely holds its own – while an all-BA setup will never quite match the physical impact of a good hybrid or dynamic driver design due to the lack of air being physically moved by the driver, the Angie does portray a nice sense of impact and hum. Playing “Heaven” by Emile Sande, the opening sweep of sub-bass thrums nicely in the background – not the most omni-present rendition I have heard, but enough to give the track the right feeling of substance. Sticking with the track, the kick drums are crisp and produce a nice thud on impact, playing off well against the crispness of the snare to pin the track down nicely. Switching up to a little rock music, “Bad Rain” by Slash kicks off nicely, with the growling bass riff that kicks in at the 23 second mark possessing plenty of rasp and menace, with the detail kicked out by the drivers giving a nice sense of density to the vibrating bass strings as they fire off into your left ear (the track is mastered with the bass slightly off centre, so the imaging here feels spot on). Looking for more liquidity, “Hello, It’s Me” is next up in the playlist – Ken Block’s ode to unrequited love sounding velvety and smooth as the bassline slinks around underneath the crashing guitar riff. It feels slightly more defined and less thick that IEMs like the Vega, with more of a textured feel to the sound rather than complete silky smoothness, but no less satisfying as a result. Overall, the bass on the Angies feels just right for my personal preferences, able to go big when the occasion (and track) calls for it, and able to show bags of detail and a nice turn of speed when it doesn’t. Moving up into the midrange, the Angie provides a clean and clear sound, feeling neither massively forward or recessed to me. On first listen, it doesn’t grab you by the throat and beat you into submission with its more obvious qualities, but once you ease into the tuning, it gives you a slightly coloured but very resolving sound, retaining a nice thickness of note while allowing the music to flow through like a draught of refreshing icewater on a summer’s day (while still being warm – nothing like a good mixed metaphor!). Another thing that creeps up on you is the excellent instrumental timbre portrayed by the octa-driver setup, with piano notes and acoustic guitar strums carrying a sense of realism that more “etched” or hyper-real tunings can lack. Something that also contributes to that sense of realism in the midrange is the excellent micro-detailing throughout, with tiny little room sounds and scuffed harmonics hovering at the edge of the soundscape but never overwhelming the core of the sound. It feels like the audio equivalent of looking at a Persian rug – from afar, a beautiful blend of colour and shape, but if you concentrate hard enough, the minute detailing of each strand can be picked out and admired. 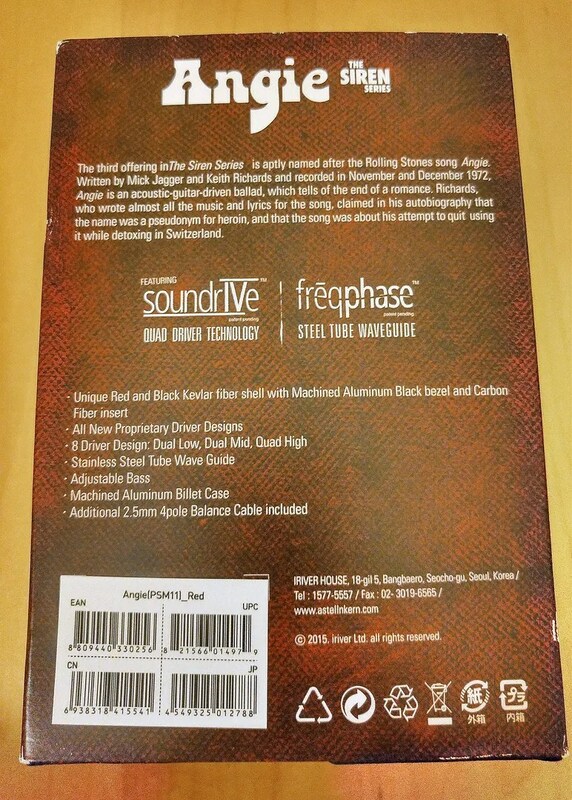 Given that this is an IEM designed by a famous rock roadie, guitars sound excellent (as expected), with a nice warmth and crunch to the sound that plays extremely well with most types of rock music. Vocals get a similar treatment – spinning up “Mother Maria” by Slash and Beth Hart, and the husky tones of Hart’s voice sound smoky but smooth at the same time, with the breathing patterns of the singer clearly audible at the end of each vocal phrase and the raw emotion of the song pouring through. The spanish guitar refrain running through the track sounds crisp and silken, again evoking the reality of the nylon string sound. Putting some more driving rawk music into rotation and the definition and crunch the drivers are capable of is highlighted well, “Growing On Me” by The Darkness pinballing through the listener’s ears in a crunch of guitar chords, showing excellent separation to highlight the tiny differences in the main riff between each earpiece. Focusing back on vocals, “High Note” by Mavis Staples highlights the singer’s excellent tone, with her voice raising through the range with power and finesse, keeping a beautiful texture and smokiness at all times. The gospel style chorus which blends multiple different singers together is a beautifully constructed wall of sound, with each singer adding a sense of character and individuality to the sound while still blending into a perfect harmonic crescendo. With this track, it is easy for the chorus to belnd together, but the Angie keeps each singer easily distinguishable in the overall sound. Staying with Ms Staples, the simple bluesy acoustic riff of “Don’t Cry” sounds lifelike, the strumming of the strings evoking a mental picture of plectrum hitting each string and the emotion of the song translating perfectly. When I initially tried to write up this section, I was a little bit lost as to how to describe the sound, until I realised the most important facet of the Angie’s presentation – everything in the midrange sounded natural and true to life (or as true to life as it can be considering there is a small magic pixie singing the notes into your ear from a little metal box of wonder sitting in my palm). The IEMs just place you in the sound, with a little warmth and thickness to colour it on the way through but not enough to pull you out of the moment. 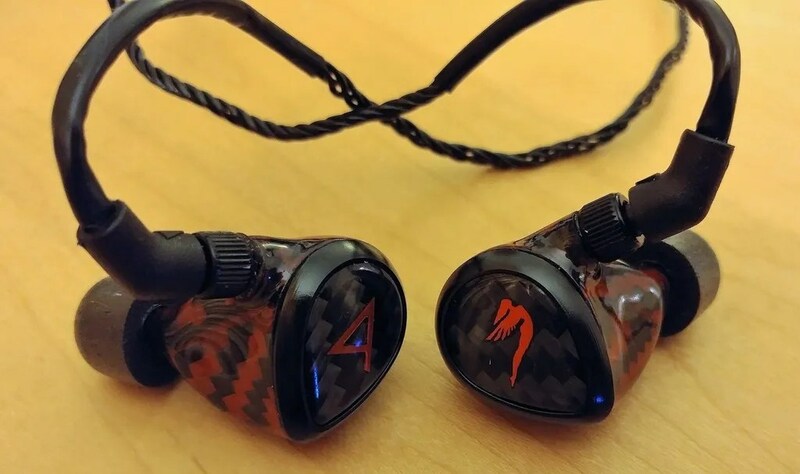 I have heard more “compelling” mid-range tunings, and I have heard IEMs with more perceived detail or technical prowess than the Angie, but the only thing I have heard so far that comes close to evoking the same feeling of reality and engagement in the music is the Campfire Vega. Stellar. Given that the Angie has four of its total loadout of 8 balanced armatures dedicated to treble, you might expect a top-heavy sound to be the order of the day. In fact, while the Angie does have a nice extension up into the audio rafters (topping out at 23kHz), the priority is very much clarity over crispness. There is a beautiful smoothness to the higher frequency sounds, playing perfectly into my own sonic preferences for a velvety and crystal clear treble tuning. The extensions is most definitely there, with cymbals decaying into nothingness right on the edge of hearing and each note of a wailing guitar solo or falsetto voice presenting strong and clear, just without any audible grain or harshness my (admittedly more bronze than golden) ears can hear. Working through my usual playlists, “Starlight” by Slash and Myles Kennedy is up first. This is a track underpinned by a dissonant opening guitar riff and some stratospheric wailing from the Alter Bridge frontman, which can make for some very harsh listening on some audio rigs. The Angie handles the track beautifully, Kennedy’s powerful rasping falsetto retaining all its supersonic extension without a hint of shrillness, coming through strong and clear without triggering any fatigue or discomfort. The sense of clarity to the sound is truly impressive – you sometimes read about “veils being lifted” when people write about gear in this rarified price bracket, but with the Angie just seems to do away with the whole curtain concept and tricks your brain into thinking the sound is taking place directly inside your head instead of piping through two small housebricks inserted into your ears. Having established its credentials with screaming guitar and similarly screaming singer, I fired up some Chris Stapleton to check for sibilance. “Whiskey And You” is my favourite song from his excellent debut album, full of emotion, great sounding acoustic guitar work and poignant lyrics. Unfortunately, it appears to have been mastered in a cement mixer, with the singer’s already gravelly voice being turned into something that can sandpaper your ear canal on the hotly mastered chorus. Again, the Angie excels here at taking the rough edges out of the sound without smoothing or blurring the sound, leaving it as gravelly as nature (and the whiskey Stapleton sings about) intended, but without any of the unpleasantness that normally accompanies this track on harsher gear. Switching to electronica, “Go” by The Chemical Brothers sounds just as smooth, with the swirling synth floating around the chorus kicking in strongly and generating the right amount of euphoria as it sweeps through the top of the soundscape, getting my foot tapping more than once in tandem with the percussive vocals and the simple but catchy bassline. The hi-hat that accompanies the drum beat is sometimes lost in the mass of synth and other electronic noise on this track, but the Angie preserves the “tsk” of the cymbal nicely, adding another delicate layer to the dense wall of sound without overshadowing any of the other sounds. The staging on the Angie is excellent, with good width outside the ears on the X-axis, and an almost equal sense of depth from front to back, placing instruments anywhere from in front of your head to sat in the base of your skull with relative ease. The depth and precision of the instrument placement combine well to offer a very precise positioning inside your head, with busy tracks all resolving quite clearly and allowing the listener to follow any particular strands (guitar lines, bass etc) with ease due to the excellent feeling of separation. With separation sometimes comes a sense of dislocation, but the Angie manages to blend all the separate musical lines together in the overall presentation to retain a cohesive feel and (as mentioned previously) a “rightness” to the sound. This is sometimes referred to as one of the lesser Siren Series models considering the pricing of the 12-driver flagships, but for me this is still a TOTL experience in this aspect – if the other models exceed the Angie, they must be doing something seriously special. Campfire Audio Vega – the Vega were my first introduction to TOTL audio, and remain my current “gold standard” for audio sound quality as of this review. They retail in roughly the same price bracket as the Angie did at time of launch, so this is quite a good comparison. In terms of ergonomics, the Vega is a fraction of the size of the Angie, and its sleek Liquidmetal shells are far more ergonomic to wear for extended listening periods than the Angie’s more sizeable curves. The Angie never feels fragile, but the overall solid metal build of the Vega makes it feel more capable of surviving a bit of rough and tumble than the more genteel carbon fibre of the JH/A&K model. The cables are a draw, with the SPC Litz being more ergonomic for the Vega, but the JH 4-pin connectors locking more solidly with their screw in O-ring, and the two cables offering a choice of 3.5mm or 2.5mm balanced connectors giving a wider spread of options for the Angie. Moving on to sound, the bass is much meatier on the Vega, with a solid authority from the single DD driver of the Vega that makes the Angie sound a little anaemic in direct comparison. The Angie isn’t a bass-shy IEM by any means, but compared to the Vega, it comes across as a dryer and more textured take, rather than the more visceral and physical sound of the Vega. Sub-bass is also better on the Vega, with more presence down in the very bottom of the frequency range, although the Angie matches it quite well in terms of technical extension. Speed is also very similar between the two, with the Vega edging it if anything, which is a surprise given the all-BA nature of the Angie. Midrange is fairly well matched, with the more spacious sound of the Angie staking up well against the denser and more energetic Vega. In terms of detail, both are similar, with micro-detailing and general layering and placement of instruments feeling suitably 3D in both IEMs. The Vega has more of a sense of dynamics to the sound compared to the more laid back Angie. In terms of treble, the Angie feels like the clearer of the two – to be frank, they are both TOTL inpears so in both cases the sound is impeccable, but while at first listen the Angie doesn’t feel as sharp as the more crunchy Vega, the openness of the sound and slightly wider soundstage give a more effortless feel to the treble to my ears. Overall, these are very well matched headphones, with the Vega pulling ahead in terms of solidity and energy, and the Angie providing a less forward but no less engaging sound, with a wider soundscape. Overall, both are on a par, but if I had to stick with one, it would be the Vega for my personal preference, with the lip-smacking sound of the bass and lower mids just winning it for me. 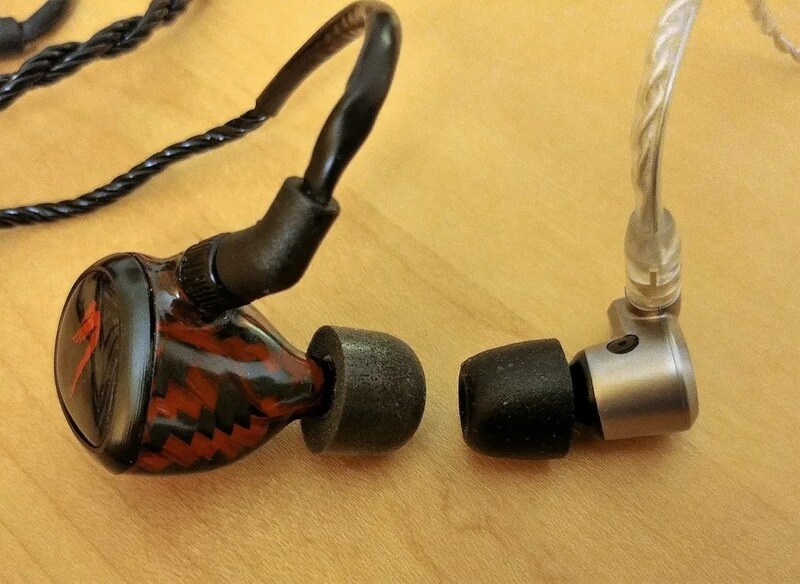 Until recently, I hadn’t had the pleasure of hearing a true “TOTL” pair of in-ear monitors. As a naturally sceptical (some may say miserable!) 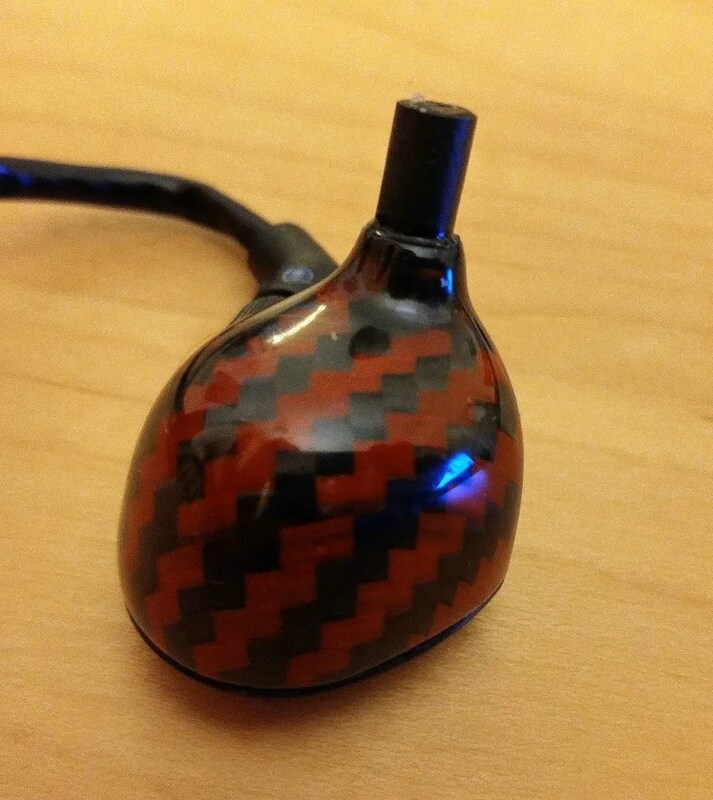 man, I always harboured a healthy dose of disbelief when I read about the latest and greatest thing in the IEM world, wondering how exactly a few more drivers or a different type of mini-speaker was supposed to make a night and day difference between the mid-fi gear that has given me so much enjoyment since I got into this hobby. Much like my epiphany with the Campfire Audio Vega, the Angies have dealt a further blow to my cynicism, and proved that there is gear out there that can really blow your mind (and your wallet) with the quality of music they reproduce. As you can see by the scores across the board, apart from comfort and fit, the Angies produce a simply outstanding sound – at once clear yet rich and never over-emphasised, with a natural tone and portrayal of traditional “band” instruments that places the listener firmly within the recording. The variable bass response lets you warm or cool the sound to your personal preference, and the beautiful coherence of the 8-driver unit never lets you pick which of the various armature arrays is doing what at any given time. These aren’t a monitor that will blow your mind with details or super-vivid sound in any of the ranges, but as you get more and more used to them, they will make other gear you listen to sound less true and more stylised, the magic of the quad-armature treble and Jerry Harvey’s patented FreqPhase technology for once living up to the hype and transporting the listener into their own uniquely cohesive audio landscape. Are they worth the price? If you can afford it, and you can deal with the massive shells needed to house all those patents, then the answer for me is yes – they provide a supremely musical take on a “clear” sound signature, with enough of everything you need to feel that you are listening to something at the top table of the audio world. If the Angie II improves on this signature, then they will be something else entirely, but as it stands, if you come across a pair of these on the second hand market and are looking for something just a little special, Angie could be a very accommodating young lady. What do you think abt Angie vs Andromeda? Thanks!